By mapping minerals on the surface of Mars using the European Space Agency's Mars Express spacecraft, scientists have discovered the three ages of Martian geological history � as reported in today's issue of Science - and found valuable clues as to where life might have developed. The new work shows that large bodies of standing water might only have been present on Mars in the remote past, before four thousand million years ago, if they were present at all. Within half a billion years, these conditions had faded away. The earliest, named by the authors as the 'phyllosian' era, occurred between 4.5�4.2 thousand million years ago, soon after the planet formed. The environment was possibly warm and moist at this time, allowing the formation of large-scale clay beds, many of which survive today. The second era, the 'theiikian', took place between 4.2 and 3.8 billion years ago. It was prompted by planet-wide volcanic eruptions that drove global climate change. In particular, the sulphur these eruptions belched into the atmosphere reacted with the water to produce acid rain, which altered the composition of the surface rocks where it fell. Finally, there was the 'siderikian', the longest lasting of the Martian eras. It began sometime around 3.8�3.5 billion years ago and continues today. There is little water involved in this era; instead, the rocks appear to have been altered during slow weathering by the tenuous Martian atmosphere. This process gave Mars its red colour. The eras are named after the Greek words for the predominant minerals formed within them. The one most likely to have supported life was the phyllosian, when clay beds could have formed at the bottom of lakes and seas, providing the damp conditions in which the processes of life could begin. However, there are still question marks. The team points out that the clay beds might have been formed underground, rather than in lakebeds. "Hydrothermal activity below the surface, the impact of water-bearing asteroids, even the natural cooling of the planet could all have promoted the formation of clay below Mars's surface. If so, the surface conditions may always have been cold and dry," said Bibring. After this initial period, water largely disappeared from the planet's surface either by seeping underground or being lost into space. 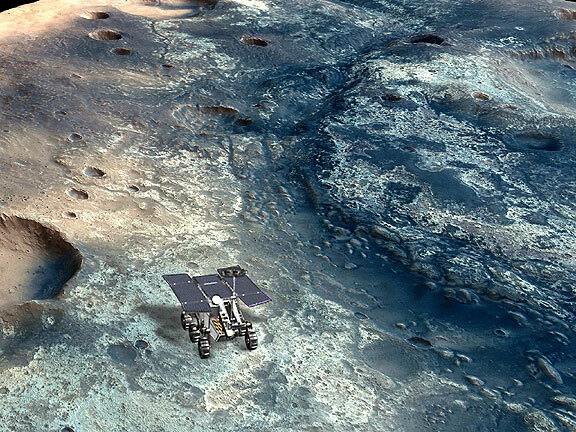 Except for a few localised transient water events, Mars became the dry, cold desert seen by spacecraft today. This new identification of clay beds on Mars provides high-priority targets for future Mars landers that seek to investigate whether Mars once harboured life. "If living organisms formed, the clay material would be where this biochemical development took place, offering exciting places for future exploration because the cold Martian conditions could have preserved most of the record of biological molecules up to the present day," concluded Bibring. The full results are published in the 21 April issue of the journal Science. The article, 'Global Mineralogical and Aqueous Mars History Derived from OMEGA/Mars Express Data', is by Jean-Pierre Bibring, Yves Langevin, Francois Poulet and Brigitte Gondet (Institut d'Astrophysique Spatiale - IAS, Orsay, France), John F. Mustard (Brown University, Providence, USA), Raymond Arvidson (Washington University, St.Louis, USA), Aline Gendrin (Institut d'Astrophysique Spatiale - IAS, Orsay, France & Brown University, Providence, USA), Nicolas Mangold (IDES, Orsay Campus, France), P. Pinet (Observatoire Midi-Pyrenees, Toulouse, France), F. Forget (LMD - Univ. Paris 6, France), and the Mars Express OMEGA team.